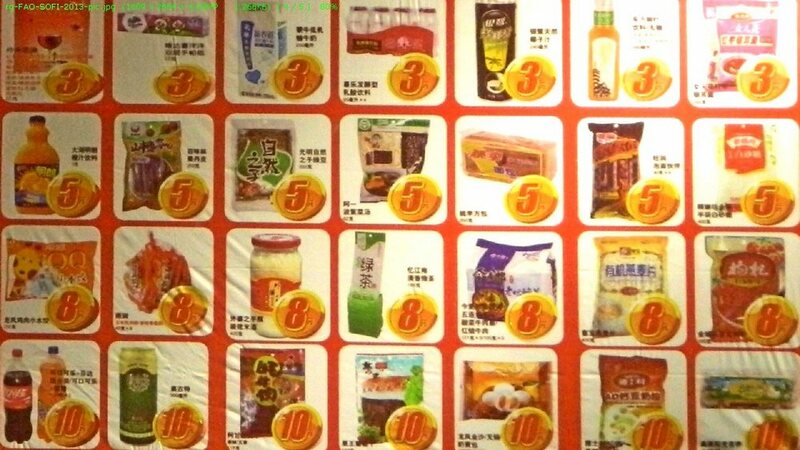 Cheap processed food advertised in Chengdu, P R China. Why has the Food and Agriculture Organisation (FAO) not stated what has become painfully obvious to households the world over – that the macro-economics which determines everything from what farmers grow and what city workers pay for food is utterly out of control? This silence is why FAO’s ‘State of Food Insecurity in the World 2013’ – with its updated estimates of undernourishment and its diplomatic paragraphs about progress towards the Millennium Development Goals (MDG) and World Food Summit (WFS) hunger targets – remains conceptually crippled. The roles of the food industry, its financiers, its commodities satraps, the marketers and their fixers in government, the networks that link legislators and food business investors in countries with growing processed foods businesses, all these shape food security at the community and household level. Yet none of these are considered critically by an FAO report that ought to be thoroughly non-partisan on the matter. The FAO ‘State of Food Insecurity in the World 2013’ (condensed to SOFI 2013) has said that “further progress has been made towards the 2015 MDG target, which remains within reach for the developing regions as a whole, although marked differences across regions persist and considerable and immediate additional efforts will be needed”. How many more food insecurity indicators are needed to tell governments what their working class households already know? The table of SOFI 2013 indicators. In the first place, let’s consider the 2015 Millennium Development Goals (MDG) target concerning hunger. This is to halve the proportion of hungry people in the total population. There is also the World Food Summit (WFS) target, which is to halve the number of hungry people. Both have 2015 as the target year. However, any hunger has no place in a world that today produces more than enough food to adequately feed every elder, child, woman and man. But there is another aspect, and this is: who does the FAO think is paying attention to ‘global’ targets and placing these targets above any local needs or ambitions? Just as the MDGs are scarcely known and recognised outside the enormous development industry which perpetuates a growing mountain of studies and reports on the MDGs, nor are ‘global’ hunger reduction targets. When alleged leaders of the world gather together in the United Nations General Assemblies and other grand international fora and ask (in a tiresome and repetitive way) how we are going to feed 9 billion people, no individual smallholder farmer listens, because growing and feeding is done locally, and therefore ‘targets’ are also local, just as food insecurity or security is local. This is why the SOFI 2013 approach – which is to say that “the estimated number of undernourished people has continued to decrease [but] the rate of progress appears insufficient to reach international goals for hunger reduction” – is utterly out of place and does not in any way reflect the numerous variety of problems concerning the provision of food, nor does it reflect the equally numerous variety of local approaches to fulfilling food provisioning. Next, it is way past high time that FAO and the UN system in general jettison the “developing regions” label. It has no meaning and is an unacceptable legacy of the colonial view. Besides, as I point out a little later, food inadequacy (including insecurity and outright poverty) is becoming more and not less prevalent in the so-called developed regions. And moreover, I object to “considerable and immediate additional efforts will be needed” to reverse food insecurity, as the SOFI recommends, because this is the green signal to the global industrial agri-food industry to ram through its destructive prescriptions in the name of additional efforts. SOFI 2013 also “presents a broader suite of indicators that aim to capture the multi-dimensional nature of food insecurity, its determinants and outcomes”. Once again, it is way past high time that the FAO ceased encouraging a proliferation of indicators of every description (and then some) that do next to nothing to ensure low external input and organic agriculture supported by communities and local in scale and scope, and in which the saving of seed and the preservation of crop and plant diversity is enshrined. There is not one – not a single indicator from FAO (and not one from any of its major partners, the World Food Programme (WFP) and the International Fund for Agricultural Development (IFAD) – for this need that is at the core of the myriad wonderful expressions of human civilisation. 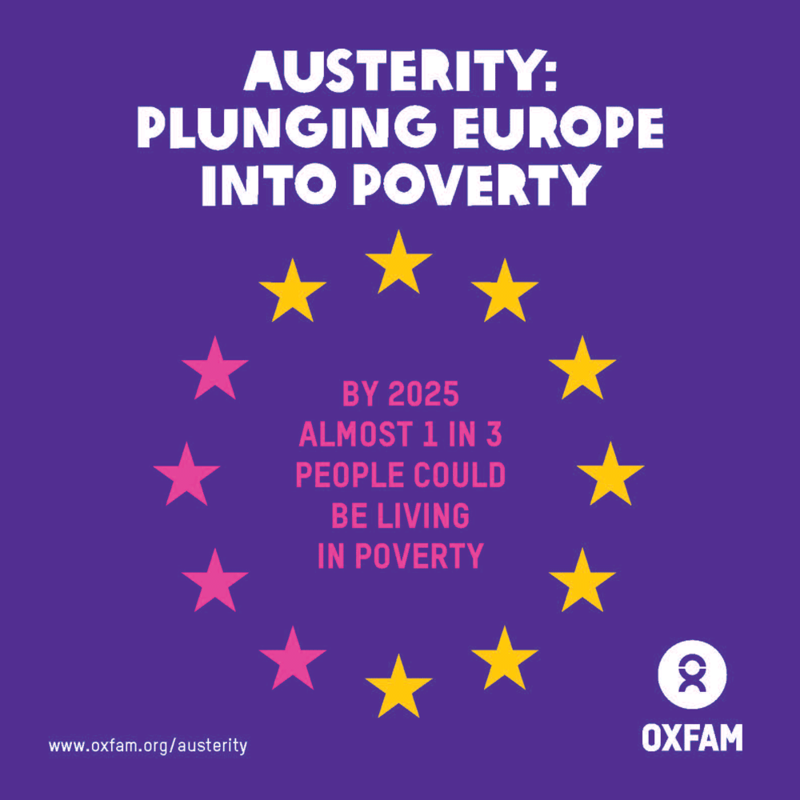 Oxfam has made graphic the growing poverty in the European Union. SOFI 2013 also said that “recent global and national food consumer price indices suggest that changes in consumer prices were generally much more muted than those recorded by international price indices, often influenced by greatly increased speculation in spot, futures and options markets”. This unfortunately is completely untrue, for even FAO’s own database on national consumer price indexes (supplied by FAO member countries themselves) suggests that the CPI follows international price indices (this blog has pointed out the correlation a number of times in the last two years). And it is the same macro-economics that rewards speculators in “in spot, futures and options markets” which also deepens food insecurity every year. Now, to return to the question of who is “developing” and who is not. The European Union (28 countries) has a population of 503 million (the early 2012 estimate). The USA has a population of 313 million (mid-2012 estimate). How large a group in both the European Union and the USA are hovering around the poverty lines, or who are plain poor, and who cannot afford to buy enough food for themselves? In a report released in September 2013, the Oxfam aid agency warned that the poverty trap in Europe, which already encompasses more than 120 million people, could swell by an additional 25 million with austerity policies continuing. The report, ‘A cautionary tale: Europe’s bitter crisis of austerity and inequality’, said that one in two working families has been directly affected by the loss of jobs or reduction of working hours. Across the Atlantic, a US Census Bureau report released in September 2013 titled ‘Income, Poverty and Health Insurance Coverage in the United States: 2012’, poverty was found to be “at a near-generation high of 15 percent, close to the high point since the 1965 War on Poverty, the 15.2 percent rate reached in 1983”. This report found that 46.5 million USA ctitzens (about 9.5 million families) live in poverty and that some 20.4 million people live on an income less than half of the official poverty line of the USA. FAO’s ‘State of Food Insecurity in the World 2013’ will with its present methods, outlook and biases be useful neither to cultivating communities growing the food we eat, nor to administrators in districts and provinces who must plan and budget to encourage local action that brings about food security, nor to the member countries of the United Nations if it continues to ignore the very large and growing numbers of the poor in the European Union and USA – 170 million poor people, and therefore food insecure, is a population that is considerably larger than that of any country in sub-Saharan Africa which inevitably figures in these reports. Here are the materials for FAO’s ‘State of Food Insecurity in the World 2013’: The FAO news story. A frequently asked questions document. The FAO page on State of Food Insecurity 2013. The executive summary. The full pdf file and chapters. The e-book. 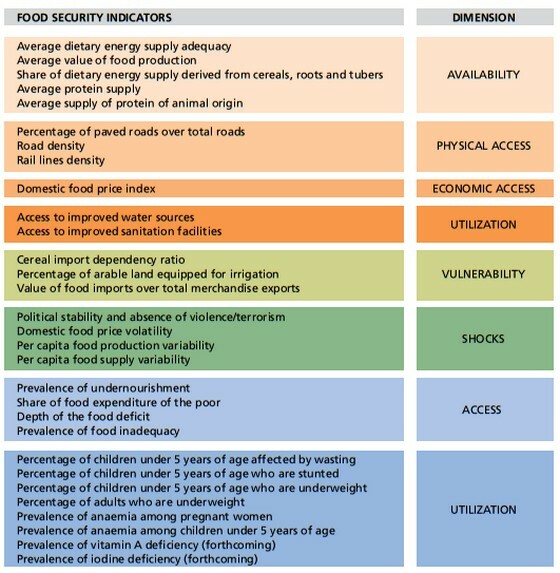 The food security indicators data.